OUT OF BUSINESS / M.I.A. My personal 3G cranks out 165AMPS max. I don't care what other people and internet sites say about the 3G alternators, or what claims they make about other alternators. As far as I know I'm the only person to publish the actual testing. You're preaching to the converted Ryan ! Nice work on the photos ! I'd say the 3G swap was the single best mod I've done to my 86 ...period. It was also a virtual bolt on for us V-belters. for the un educated: what did you get those off of? most anything with a 5.0 would have one right? 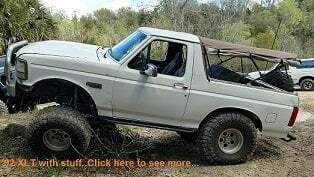 Bronco Info: 1982 Toyota with the roof cut off. 351W, D60 welded, 14bolt, 5.13s, on 39.5 TSLs with beadlocks. If you want to buy one right from da zone the PN for a Duralast is from a 94 Mustang PN: DL7734 It's something like a $40 core though. I'm gonna try and find one in a bone yard. 1982 Toy Chasis & Cab. 351W, C6, NP203/205, D60 welded, 14 bolt Detroit & 5.13s, running on 15" wheels and 40s. Most of the 130amp 3G's will crank out 140-160amps. Ford part # F6UU-10300-FA is a 130amp 3G alternator that will fit the later serp trucks. Last I checked dealer cost was over $225, shop around. Ryan, when you say be careful, there was a a 95amp alt..How can you tell the difference, between that one and the 130? I'm assuming the 95amp can be found in those models you listed as well?? The vent holes patern in the front case can be used the ID the size. sucky stereo, mech fan, there wasn't a need for than much power. I have a quick question for you our anyone else that would know. was a81 Bronco Custom. Sold See my superford link for how I built her! I am lost in lala land for the time being. Make sure your wiring is up to the test first. An inline fuse is a good idea also. One simple fact... the 3G alts do NOT hold up to off-road use. Ask anyone who wheels in muddy/dusty environments and they'll tell you that they've gone through several 3G alts. I must be one lucky SOB then. My 3G is 2 years old now in my bronco. I run alot of extremely dusty trails out here in cali. I have abused my battery where it drops to 10 volts and the alt recharges it completely. I did a fair amount of winching this weekend and it dropped below 10 volts the whole time when winching yet the 3G is still alive. oh by the way. This one was a $15.00 junk yard pull. mine survived my old engines blow up. crank broke which snaped the belt off it. and spewed alot of oil over it. From what I've read no alt is great at mud and dirt. the problem is after the trail run, the dirt sitting inside causes the problems. If you clean it out before the , it should live longer. i have been hearing about the 3g having a weak regulator, plus since its an internal regulator, once it goes, its time to get another alt. wasnt it Soderblom that said that he blew one of his 3g's by just holding the window button to long or somthin simular? it just makes the large case alt seem like a better setup, plus it puts out almost just as much power.